Colour coating: Top 5+20um up / back : 5+2um. Being as a leading exporter of in China, we have advantage to supply PPGI , GI, CRC, and Corrugated Steel Sheet with most competitive prices. We are making continuous efforts to supply you with cold rolled steel coils, galvanized steel coils, prepainted steel coils, and all dimensions of steel sheets to meet end users’ demands by cut-into-length and slitting lines. We can offer you accurate dimensions, minimized tolerance, superior heat and corrosion resistance, and aesthetic appearance. Prepainted steel sheet is coated with organic layer, which provides higher anti-corrosion property and a longer lifespan than that of galvanized steel sheets. The base metals for prepainted steel sheet consist of cold-rolled, HDG electro-galvanized and hot-dip Alu-zinc coated. The finish coats of prepainted steel sheets can be classified into groups as follows: polyester, silicon modified polyesters, polyvinylidene fluoride, high-durability polyester, etc. The production process has evolved from one-coating-and-one-baking to double-coating-and-sigle-baking,double-coating-and-double-baking and even three-coating-and-three-baking. The color of the prepainted steel sheet has a very wide selection, like orange, cream-colored, dark sky blue, sea blue, bright red, brick red, ivory white, porcelain blue, etc. The prepainted steel sheets can also be classified into groups by their surface textures, namely regular prepainted sheets, embossed sheets and printed sheets. 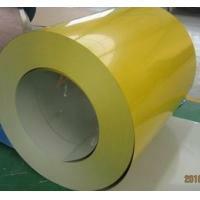 The prepainted steel sheets are mainly provided for various commercial purposes covering architectural construction, electrical household appliances, transportation, etc. We sincerely hope to establish long term business with your esteemed company under mutual benefits. We are ready to provide you with our quality products, most competitive price and best service. Ral Code or as per customer’s samples. Produce according to RAL Color System or as per buyer’s color sample.